Torsion springs are helical coil springs that exert a torque or rotary force. Torsion springs are wound clockwise or counter clockwise so that the deflection causes the spring to wind up from the free position. Torsion springs reduce in diameter as they wind up and their body length becomes longer. 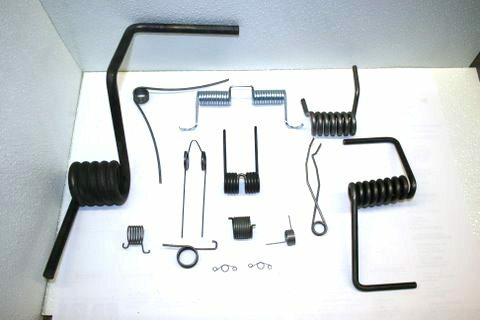 Torsion springs are typically tight wound but can be produced with pitch in them to reduce friction. These springs should be supported by a rod thru the center whenever possible. The legs on these springs vary greatly. Our machinery allows us to make a wide variety of bends and angles on the legs to meet many requirements including the double torsion spring.